Rookie Younghoe Koo missed a 44-yard field goal with five seconds left as the Los Angeles Chargers lost to the Miami Dolphins, 19-17, Sunday in the first NFL regular-season game at StubHub Center. Cody Parkey’s fourth field goal, a career long-equaling 54-yarder with 1:05 to play put the Dolphins ahead for good. The Chargers began the ensuing drive on their own 20-yard line with 1:01 left. Philip Rivers completed the first three passes on the drive for 13, 17 and 10 yards, moving the ball to Miami’s 40-yard line. An illegal use of hands penalty against the Dolphins and a nine-yard pass from Rivers to Keenan Allen put the ball on Miami’s 26-yard line. Rivers then ran right for no gain to give Koo a better angle. The kick sailed wide right, although the Chargers Cannon was fired off in celebration as its operator thought the kick was good. This was the second consecutive game Koo missed a late crucial field goal attempt. He had a 44-yard attempt blocked with one second left in a 24-21 season-opening loss to the Denver Broncos Monday. 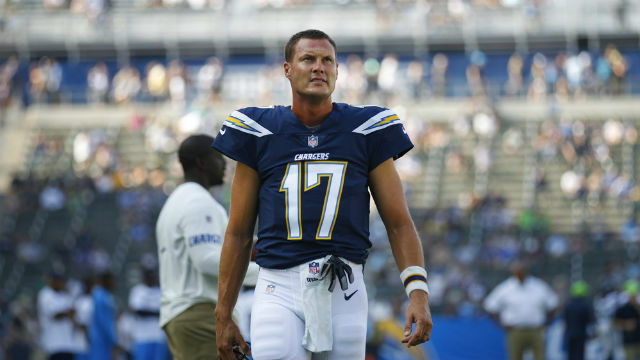 Koo also missed a 43-yard field goal with 30 seconds remaining in the first half Sunday as the Chargers started a season 0-2 for the first time since 2008. The loss spoiled Antonio Gates making his 112th touchdown reception, the most by a tight end. The touchdown came on a seven-yard pass from Rivers with 8:24 left in the third quarter and gave the Chargers a 17-10 lead. Several teammates piled on Gates in the end zone following the record-setting catch. Gates had tied the record previously held by Tony Gonzalez in the Chargers final game in San Diego on New Year’s Day. Parkey kicked 28- and 35-yard field goals on the Dolphins next two possessions. Miami began the winning drive on its 49-yard line following a 14-yard punt return by Jakeem Grant. Jay Ajayi ran for 10 yards on the first play of the drive, then ran for two yards on each of the next two plays and caught a one-yard pass from Jay Cutler on the final play before the field goal. The Dolphins were playing for the first time since Aug. 31 when they defeated the Minnesota Vikings 30-9 in a preseason game. Their planned season opener last Sunday against the Tampa Bay Buccaneers in Miami Gardens, Florida was postponed because of Hurricane Irma. They practiced in Oxnard at the Dallas Cowboys training camp facility adjacent to the River Ridge Golf Club Wednesday through Friday. Miami wore a “One Florida” decal on its helmet Sunday, as did the state’s other NFL teams, Tampa Bay and the Jacksonville Jaguars, representing the commitments by the teams to regroup and rebuild following Hurricane Irma. The Chargers out-gained the Dolphins, 367 yards to 336, led 24-21 in first downs but trailed 33:22-26:38 in time of possession. Neither team committed a turnover. Rivers completed 31 of 39 passes for 331 yards and one touchdown. He moved past Vinny Testaverde into 11th place on the career passing yards list with 46,356. He needs 648 to pass Pro Football Hall of Fame member Fran Tarkenton for 10th all time. Cutler completed 24 of 33 passes for 230 yards and one touchdown in his debut as Miami’s quarterback, four months after signing with Fox Sports to become an analyst on NFL broadcasts. Cutler signed with the Dolphins last month after starter Ryan Tannehill tore his left ACL in the first non-contact practice of the season, sidelining him for the season. Ajayi ran for 122 yards on 28 carries, his fifth 100-yard game in his 25- game NFL career. The paid attendance was announced at 25,381, including many fans clad in aqua Dolphins jerseys. The stadium’s listed capacity is 27,000, but the Chargers will not announce a crowd larger than 25,800. Approximately 500 seats are reserved by law for people with disabilities, the majority of which went unsold for Sunday’s game. The Chargers don’t count their 1,200 complimentary tickets used by players, team staff and corporate sponsors toward their attendance figure. The Chargers led 10-3 at halftime on Melvin Gordon’s one-yard touchdown run 5:01 before halftime and Koo’s 41-yard field goal with 13:41 left in the half. The field goal was Koo’s first of his NFL career. Parkey kicked a 30-yard field goal on Miami’s first possession for the first quarter’s only points. Parkey was playing his first game for the Dolphins after being claimed on waivers from the Cleveland Browns Sept. 3. Miami tied the score, 10-10, on the opening possession of the second half, driving 60 yards on seven plays, culminating with Cutler’s 29-yard touchdown pass to Kenny Stills. The Dolphins were aided by a 15-yard unnecessary roughness penalty against Chargers safety Tre Boston.